Concept art from Xenosaga Episode 1. The artist used acrylic paint for the final drafts. Coming from an art background, I simply cannot stay quiet about what I’m seeing here. I suppose I’ll start with why I care so much about the artbook situation. Usually when someone looks at collector’s edition, they tend to scoff at the idea of there being an artbook. Worse yet, it’s seen as a cheap cop-out when it’s the only thing offered in those editions (if the price is too high anyway, in which case I’ll agree). I tend to get giddy when I see that an upcoming game is also coming with an artbook. I caught the artbook bug well before I got my first one. It started with Xenosaga Episode 1, where you could unlock concept art at the game’s casino (ironic though considering that scenes in that game were censored, though this was before I had easy access to the internet). Still in highschool at the time, I remember spending entire weekend nights playing on the poker table (and slowly learning the rules) to get enough coins to unlock more concept art. My artstyle was still developing at the time, mostly drawing in one way and in one perspective. More often than not, any character (either original or fanart) I drew on a piece of paper was a “final draft”, the one I would show off to my friends and family. With every piece of concept art I unlocked, I learned more and more about the ideas and processes that went into making each character. It also helped that each one also came with a process description from the artist himself. So I started teaching myself to do what he did, nearly copying by eye what I saw on the screen. I then applied those techniques to any original characters I had created at the time. Several years later, I would pick up my first ever collector’s edition of a game, Ar Tonelico: Melody of Elemia. The collector’s edition actually came standard, so with each copy of the game came an artbook, featuring hi-res art of the characters in the game and a short bio on the characters. I was hooked, taking any chance I got (usually when taking a dump in the bathroom) to check out the art and read the bios. As time went on, if a new game I wanted was coming out, I checked to see if the collector’s edition (or a first print run in most cases) came with an artbook. If it did, I made sure to get it (in several cases, the games were niche enough that most likely the old Game Champ would have it and only a handful of people would buy it, so I didn’t have to pre-order). I amassed a small collection of artbooks for several videogames, my favorites being the Tekken 6 artbook, Arc The Lad‘s manual,, and the Dragon’s Crown artbook. The artists for games usually don’t get their chance to shine like they do in artbooks. Sure we see the characters, outfits, and environments as we play the game. But the one that conceptualized it — that created the first drafts, that went through the painstaking task of re-drawing what the art lead or the director/producer told them to, either by pencil or tablet — we don’t get to see that often, nor do we get to hear from them. If we were to compare the videogame artbook to something else, it would be the liner notes of an old vinyl or CD, either containing the lyrics, pictures of the band, and several thought processes of either the song writer, someone from the band, etc. Another example would be the old big box PC games. The artbook brings you face to face, in a sense, with the artist as he or she shows their work on an intimate level and how it came to be. It’s art in its purest form. So now that brings us to Bravely Second. The artists who worked on Bravely Second are Akihiko Yoshida, Atsushi Okubo, and Makoto Tsuchibayashi. This is their chance to show off their work and how the look of the game came to be. They’ve made their book available in Japan for some time now, separate from the game. That’s usually the case with artbooks in Japan. Over here though (and sometimes in Japan), if there is an artbook that comes with the game (as part of a collector’s edition for example), it’s usually an abbreviated version, a sample of what’s to come when the official artbook launches later. So only some of the artwork done gets featured here, while the rest go to the official book. Now if Nintendo was set to release a small sample version of the Bravely Second book, trying to avoid all the “questionable” and “problematic” images, I’d probably stay quiet. It’d be a sample version after all, much like the other artbooks I have. The main course that I want is the official one. However Nintendo is bringing over the official one, the big one that Japan got, with liner notes translated to English. So no stone is getting left un-turned with this artbook… is what I would say if Nintendo wasn’t censoring it. Unfortunately they are. It was discovered that several pictures were either getting removed from the western release or outright redrawn to avoid controversy. The case of the redrawn ones really rubs me the wrong way as, in the end, this was art that was made for the producer of the game and then decided upon. It’s a glimpse into the game development process and workflow. It’s almost a candid experience, the artist making art for someone else, unaware that we’re watching. But this? The redrawn stuff was not made for the producer, but for the censor. 2D hand-drawn art is, as stated earlier, art of the purest form, a medium as old as time. And with a medium that old, we’ve seen many times how art has been censored, whether for politics, religion, war, modesty, or a misunderstanding. When we look back at those moments, it’s with scorn that such a thing would happen. We pray that it never comes to pass, and yet it keeps happening, and each time the reason for it becomes evermore, for lack of a better term, stupid. Probably one of the most painful things I’ve seen was for a documentary on DC Comics that I saw several years ago (I forget the name though, but I’ll update if I remember). At one part of the documentary, they detailed what it was like to work under the Comics Code Authority. The artists and writers had to take their work to the CCA censorship office and, right in front of them, see their worked erased and blacked out for not following CCA guidelines. Imagine working day in and day out, sometimes overnight, drawing something that you like and that you know isn’t “wrong”, only to have it destroyed because it wasn’t “modest” or “right”. That’s what it was like to work under the CCA. And that’s what I fear with this new precedent with Bravely Second’s artbook. Suddenly, even the artists’ thought processes, i.e. the artwork, are deemed wrong. And the worst thing about all this? The book is being sold at a premium. This isn’t a first-print run or standard edition product. You have to get the Collector’s Edition to get the artbook. That’s right, you have to pay extra for something with cut content. And it’s an optional one at that, not something forced on everyone. And guess what? They’re all sold out. That means that, either by blissful ignorance or apathy, people went out of their way to pay extra for this. This has set a dangerous precedent for artbooks, especially those from other countries. This wrongfully signifies to publishers that it’s okay to censor the artists’ work, their thoughts, if it “offends” someone. Even worse, the artists might feel limited to what they can even draw behind the scenes. This is their work, their answer to the art lead or producer asking them “draw something for me”, and we can’t even see that because it’s “wrong”. I’ll wrap this up with a few theoreticals. I don’t have any of the following books, so I don’t know what’s inside them exactly, but again, let’s roll with it anyway. Imagine back to when Super Mario All-Stars was re-released, and in the artbook that came with it, it had the original Super Mario Bros. cover art (the Japanese one). There it is up there to refresh your memory. In Japan, it would be shown as normal. But then over here, because Peach is being held by Bowser, signifying her as a Damsel in Distress, the picture is cropped to not show that. Or better yet, she’s erased and replaced with a Koopa’s shell. It would change the entire meaning of the message that the picture, and by extension the game, is trying to sell. Mario is trying to defeat Bower and save the princess and her people. With her removal, it’s just the people… actually, those Toads, even though they know they’re getting saved, look too happy while being shackled against their will, so they get removed too. Now it’s just Mario defeating Bowser because whatever. Or how about Hyrule Historia, the grand compilation of Legend of Zelda storylines, interviews, and concept and official artwork. If you’re a die-hard Zelda fan, you’d want to see everything that this book has to offer, especially since Japan already had the pleasure of seeing it first. 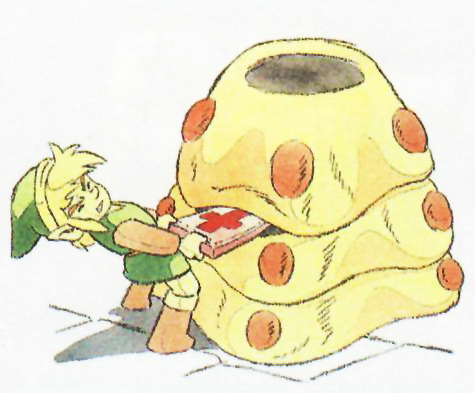 You come across this familiar picture from Link’s Awakening (shown above), and yet, something about it seems off. Saria, the woman attending Link, is now wearing a top that also covers her shoulders. No wait, her navel is showing, so now she’s actually wearing a full-on tunic. As for Link, the possibility he might be dead is too scary for some to see, so he’s presented with his eyes open instead of closed. Even though that bottle in the corner probably has a message in it, it’s a wine bottle, and it references alcohol, so it’s removed. Besides this picture, every instance of old artwork with Link holding his older shield with a cross on it is removed. Notice how messed up it becomes when the art is tampered like that? To have someone’s hard work removed like that is very heartbreaking to see. In the end, what’s being sold to us with Bravely Second‘s artbook isn’t Yoshida, Okubo, and Tsuchibayashi’s artbook. This is the Censor’s Artbook. Instead of seeing their work, we’re seeing the Censor’s work.